Every handyman needs a tool to help them reach those high up spots. With this multipurpose ladder, no job will be out of reach. 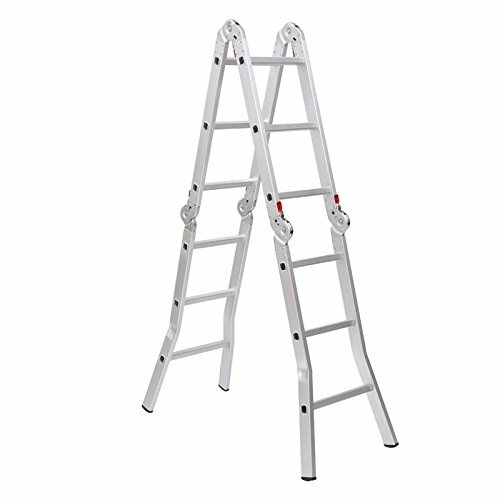 This ladder is able to be adjusted to multiple different heights to match with your working demands. With 3 multi-position articulating hinges that allow 18 different configurations, this ladder can be a step ladder, double step ladder, extension ladder, mezzanine ladder, multi-lever ladder, platform scaffold or even a stair step scaffold. The lightweight aluminum frame is perfect for any around the house jobs and has a weight capacity of 330lbs. There are securing locks to add extra stability when using the ladder and it folds up easily for storage. If you are looking for a new ladder, don't waste money on a ladder that can only fit one job. Get your adjustable step ladder today and be prepared for any work that gets thrown your way.